With winning songs from our Eric Stokes Song Contest plus music by local composer Yohannes Tona, Zeitgeist's annual Playing it Close to Home concert celebrates the wealth of musical creativity found right here in our own backyard. ​The program includes music by Eric Stokes Song Contest winners Debbie Cushman, Ryan David Stevens, and Dominic Cudd, plus new works by Ethiopian bassist and composer Yohannes Tona, including pieces inspired by Ethiopian folk music and works from his albums 1317 and Sand From The Desert. Concerts will take place on Feb. 8-9 at Studio Z, and on Feb. 10 at Ras Ethiopian Restaurant accompanied by a meal of Ethiopian cuisine. Special guest performers include Zemenay Z. Begashaw, poet/narrator; Greg Schutte, drums; Joan Hutton, saxophone; Kavyesh Kaviraj, piano; Dominic Cudd, piano; Debbie Cushman, guitar and vocals. ​Born in Southern Ethiopia to a musical duo of singer Aster and musician Tona, Yohannes had little chance escaping the musical influence around his home where there was a regular choir rehearsal or a blaring sound of electric guitar coming from across the neighboring church. Even though his father passed at an early age, he left a lasting musical impression on Yohannes and he picked up the guitar and found his way around the fretboard before his fingers were long enough to stretch across. His musical gift was obvious to the community around him that he became the default accompanist for his church’s kids choir as well as his school’s event. At the age of twelve, Yohannes was traveling with his mother, filling in his father’s shoes. A couple of years later, Yohannes arranged and played on his mothers album along side his musical hero, Getayawakal Girmaye, a household name in the Ethiopian Christian music scene. While still in high school in his hometown of Awassa, Yohannes got his major exposure to the music scene when an unusual gig landed at his feet. The biggest “religious crusade” to take place in Ethiopia was to come to his home town and a musician from his mother’s choir convinced the organizing committee that Yohannes could handle the bass chair for the event. It was at that event Yohannes picked up the bass and played his first gig in front of tens of thousands watching him standing a few feet from the world-renowned evangelist Reinhard Bonnke. By the time he moved to Addis Ababa a year later to study at Yared Music School, Yohannes was already known among the church musicians and easily made lifelong friends. The classical school had a strict rule against other musical styles, so Yohannes and his friends had to do all their fusion and jazz jams in the after hours and by sneaking into the clubs to satisfy their musical thirst. This tight group of bad boys would eventually form an instrumental group named Tsion Band and record an album which led to many studio and live gigs around major church events. However, they would regroup again as a secular band called Afro Sound with the inclusion of singers Tigist Bekele, Shewandagn Hailu and Tewodros Kassahun. Looking back, Yohannes feels fortunate to be a part of Afro Sound, a band that made a huge contribution to the Ethiopian musical landscape by giving birth to musical superstars such as Teddy Afro, Elias Melka, Girum Mezmur, Hunante Mulu, Dagmawi Ali and Misgana Mulat, all of whom are household names. In the year 2000, Yohannes relocateded to the U.S. after receiving a scholarship to study at Berklee College of Music in Boston. Two years later he was invited to become a music director at Ethiopian Church in St. Paul, Minnesota. Alongside his church commitment, Yohannes started to network with the local musicians and groups as well as the Ethiopian diaspora community. His musical and cultural journey positioned Yohannes at a cross-section of several musical styles where he would learn to adapt to all their authentic feelings and disciplines. He was able to work with local greats such as The Sounds of Blackness, The Steeles, Dr. Mambo's Combo, Darnell Davis, Cynthia Johnson, Bruce Henry and many more. He also performed with national and international artists such as Jef Lee Johnson, Benoit Delbecq, Nachito Herrera, as well as Ethiopian legends like Mahmoud Ahmed, Aster Aweke, Tewodros Tadesse, and Neway Debebe to name a few. Yohannes also leads a band under his name, and between 2006 and 2017 he produced two albums and an EP. He received the Minnesota Emerging Composer Award (MECA) in 2014, and the following year he was a recipient of an award from the Ethiopian Literary Group known as Rhythmic Pen alongside the great Ethiopian poet Bewketu Seyoum. In 2016, Yohannes’ song ‘The Jungle Way Out’ was nominated for a grammy, recorded by saxophonist Alex Han and produced by Marcus Miller. 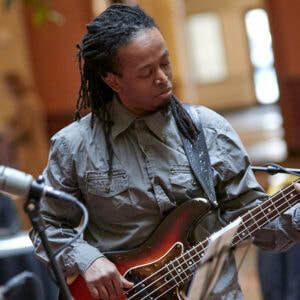 Currently Yohannes keeps busy playing the ultimate sideman gigs with R&B star Stokley Williams and a Minneapolis-based event band, Northstar, while filling the gap as a freelance bassist playing anywhere from a small downtown gig in St.Paul to the Captial Jazz Cruise on the Caribbean Sea. However, Yohannes admits "nothing compares to the experience of coming home to a kind wife and two boys, who always search for the 'treasure' hidden in daddy’s gig bag." This activity is made possible by the voters of Minnesota through a grant from the Metropolitan Regional Arts Council, thanks to a legislative appropriation by the Minnesota State Legislature.